Antipredator behavior is known to have a strong effect on prey population dynamics. While there have been many studies of antipredator behavior in population dynamic models, none have examined how antipredator behavior interacts with predator foraging mode. To examine this process, we incorporated predator and prey velocities into a simple tritrophic food chain. In this model, antipredator behavior allows prey to respond to predators by slowing their velocity in response to predator density. Prey can slow their velocity to hide from predators, but this in turn reduces their ability to consume resources, creating a trade-off between hiding and foraging. We examined the effects of both fast-moving “mobile” predators and slow-moving “sit-and-wait” predators on equilibrium prey density and amplitude of predator-prey cycles. We found that antipredator behavior was ineffective against mobile predators, but it was very effective against sit-and-wait predators. Antipredator responses to sit-and-wait predators reduced top-down control and allowed prey density to increase with increased carrying capacity. Furthermore, antipredator responses to sit-and-wait predators eliminated population cycles within the community, whereas antipredator behavior had no effect on population cycles within mobile predator communities. Therefore, our model demonstrates predator foraging mode must be taken into account when examining predator-prey cycles. 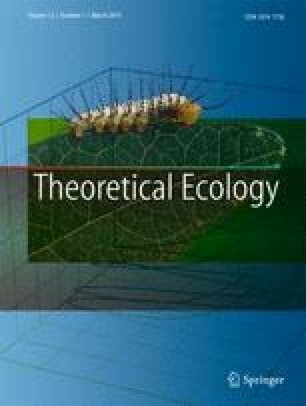 We discuss the potential implications of this model for invasive species and for trophic cascades. The online version of this article ( https://doi.org/10.1007/s12080-019-0426-3) contains supplementary material, which is available to authorized users. We thank A. Hastings and A. Sih for their insightful comments on the manuscript. We also thank M. Baskett and V. Karatayev for sharing their technical expertise. JSS thanks S. Sadowski and C. Sadowski for their support in this project. This material is based upon work supported by the National Science Foundation Graduate Research Fellowship under Grant No. (1650042) to JSS. Any opinions, findings, and conclusions or recommendations expressed in this material are those of the authors and do not necessarily reflect the views of the National Science Foundation.